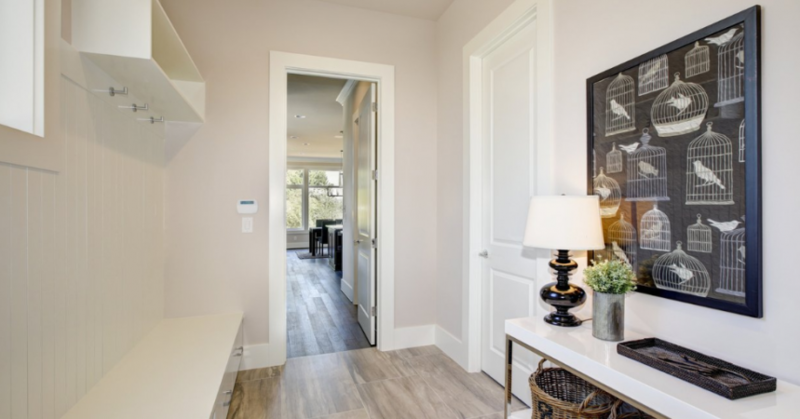 HALLWAY DESIGN IDEAS – The hallway is the first place where our guests set their foot and as we all know the first impression has always a lasting impact. It therefore becomes imperative that we do up the hallway in enticing patterns and styles such that they simply mesmerize anyone who passes through them. Although the overall décor of this house has been designed in a rustic style there is a lot of eclectic mix and match going on. 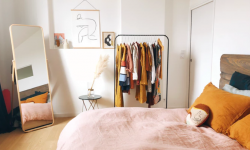 The surprising element in this room is clearly the carpet in a pattern of colors which is so much out of place in a rustic setting yet seems to fit in so well with the overall décor. This large hallway is quite impressive from the looks of it. Antique furniture vies for our attention while modern light fixtures have a field day displaying their beauty. The ceiling is however kept white to balance out the color scheme. This hallway has a mix of both antique and modern elements. The ornate chair and the fanlight hanging above the door add a period feel to the room. The white colored walls and the blue carpet further accentuate the colors of the gray sofa and make it the centerpiece of the room.. This hallway has a distinctively modern feel. The walls are painted in bold black and grey stripes while the floor is done up in Victorian tiles. A single chair is the only piece of furniture in this hallway. The most striking feature of this hallway is the way a large frame has been used to host a small art piece making it truly stand out. In the design of this hallway we can see an eclectic mix of styles. Pops of color are provided by the carpet on the floor. The contemporary styled light fixture points to the addition of another style to the room. The hallway of this apartment has been designed in a minimalistic style with furnishings kept to the minimum except for a bold drawing of the lower torso of a human being hanging at the entrance. The color scheme is kept light and neutral which ensures that the space looks more spacious. The two toned color scheme seems to work well in this room which matches nicely with the square black and white tiles. A simple but eclectic design has gone into designing this hallway with vintage pieces standing out primarily for the way they have been decorated. The chandelier adds a bit of ornateness to this simple but striking hallway. The hallway of this house looks glamorous to say the least. Polished wooden floors are complemented by a buff colored carpet and a wall in equally warm colors. The wall scones give this hallway a very traditional look. Light fixtures, in fact are the only piece of ornamentation in this hallway but they are sufficient in themselves to give the hallway a glamorous look. This hallway looks like a hall of mirrors with the walls covered in mirrors of different shape and sizes. The light colored walls and flooring complement the mirrors and create an airy and spacious feeling in the hallway. The walls of this simple hallway has been done up in a lovely white wallpaper with intricate patterns. A sliver-framed mirror is the only piece of decoration in the hallway. The all-white décor of the place gives the hallway an ethereal look. The chandelier hanging from the ceiling adds a certain level of sophistication to the otherwise simply decorated hallway. Framed pictures on the walls are the mainstay of this hallway. The rest of the décor is kept minimalistic so as not to draw attention away from the pictures. There is an eclectic mix of pictures with the one common thread being the red frames which manage to infuse the walls with a pulsating life. The hallway of this house has been turned into a mini library. The landing has been made very comfortable by the addition of plush sofas and a coffee table where one can spend some quality time amongst books. The trunk turned coffee table and the book print wallpaper add punches of style to the landing. Hallways being a part of our house deserve as much attention as the other rooms. We are confident that with the help of these ideas you can definitely glam up your hallways. 8 Splendid Barndominium Floor Plans for Your Home!